Former gymnasts tell PEOPLE they were mistreated by coaches Jeff and Rachelle Thompson. This article was originally published on People on May 31, 2016. Former NCAA athletes who trained under Jeff and Rachelle Thompson on the Penn State women's gymnastics team are speaking out about the emotional abuse they say they suffered under those coaches. Two former gymnasts described to PEOPLE how they were demeaned, pressured to continue practicing through injuries and body-shamed by coaches (one of whom allegedly told the team, “you guys look like you ate your way” through a school break). In a story that first broke in Penn State's independent student newspaper, The Daily Collegian, in April, several gymnasts who trained with them at both PSU and, previously, Auburn, spoke out about what they call unfair and abusive tactics employed by the Thompsons. The 2015-2016 Penn State team featured no seniors – all eight of the athletes recruited as freshman in 2012 had quit or were released by the team by the time they were seniors in 2016. In a May 19 email obtained by PEOPLE, Rachelle Thompson announced her plans to resign from her position at the end of June while her husband, Jeff Thompson, remains head coach of the team. A full review of the gymnastics program by the university's Office of Ethics & Compliance in December and January found no evidence of abuse. Shealyn Farley was a lifelong gymnast from a Penn State family who was eager to compete in college. Having suffered an ACL tear and meniscus tears in her left knee that resulted in six surgeries by the time she was 16, finding college coaches who would work with her injury was paramount. Farley says she was forced to train bars (the one apparatus where gymnasts don't directly use their legs) over a foam pit for hours at a time despite her knee swelling “like a balloon” during practice. “I was in pain, I was telling them I was in pain, and they were still making me do it,” she says of her trainers and coaches. Later that fall, after a three or four-day Thanksgiving break, Farley says the team returned to school for a 6 a.m. Monday workout only to be met with criticism about their bodies. Soon after that, Farley says, she saw only one way out. The athlete's departure from the team was as painful as the experience itself. She asked for a meeting with the coaches in which she told them she was quitting. Farley hopes Jeff will be next to depart. Kristin Blades was recruited by the Thompsons as a walk-on when they were coaches at Auburn University. 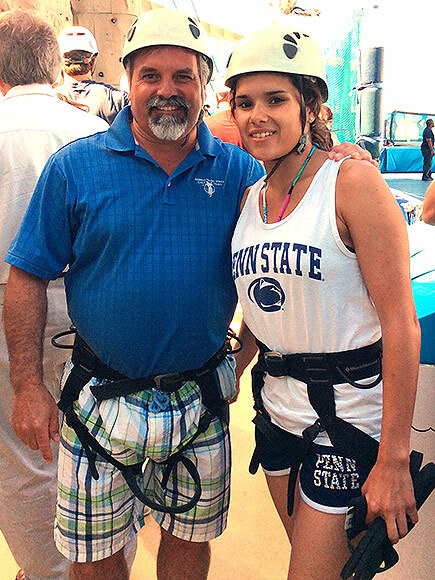 By the time she graduated high school, however, the Thompsons had been hired by Penn State, so Blades began her freshman year there in 2010 with hopes to ultimately earn a scholarship. Despite warnings from women on the Auburn team who suggested the Thompsons were not what they seemed, Blades, now 24, moved forward with her plans to attend Penn State. After a great practice the fall of her sophomore year, says Blades, Rachelle called her in for a meeting, only to deliver a stunning ultimatum. Ultimately, Blades and her boyfriend went their separate ways and she began to feel alienated at the gym. The coaches, she says, turned her teammates against her. She also underwent a second surgery on her elbow. As she recovered, Blades says she was forced to do excessive conditioning as her arm healed. Blades says Farley, among other younger gymnasts, had come to her with their concerns, though she didn't find out until later about Farley's near-suicide attempt. Concern about the women's gymnastics program is growing. In addition to former gymnasts speaking out (one told PEOPLE that the current team members are too afraid of retribution to do so on the record), an online petition calling for a new investigation into the Thompsons has garnered more than 1,200 signatures. In Rachelle's May 19 email, which was obtained by PEOPLE, the coach writes that her last day of work will be June 30. PEOPLE contacted the Penn State athletic department for comment (as neither Thompson coach was made available for interviews), and a spokesperson replied with the following statement.